Viewed as a pro-Park figure, Hwang served as the 63rd minister of justice and 44th prime minister, as well as acting president between December 2016 and May 2017. Hwang chose not to run in the 19th presidential elections in 2017, as election law requires public officials to leave office 30 days before entering the race, which would have left the office of president vacant. Emphasizing unity among the public and party members, Hwang provided vague answers to questions as to his thoughts on whether Park’s impeachment was legitimate. The main opposition party is pushing for a trial without physical detention for the still imprisoned Park. 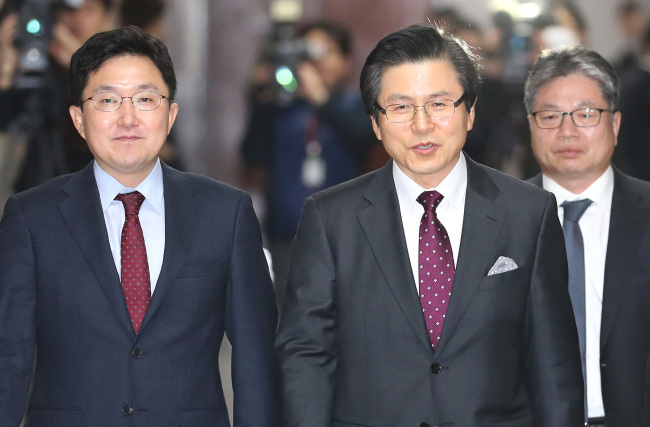 Meanwhile, other political parties pointed out Hwang’s membership would revert the Liberty Korea Party to extreme conservatism, citing Hwang’s key roles in the Park administration. “Former Prime Minister Hwang was a key figure in the Park administration who took office as justice minister and prime minister,” said Kim Tae-nyeon, chief policymaker of the ruling Democratic Party. With all eyes on Hwang’s next move, Hwang said, “I will fully listen to what the public wants and make a decision that does not fall short of their wishes,” leaving the door open to the possibility of running at the party convention. Rep. Kim Moo-sung of the Liberty Korea Party, also named as a possible candidate for the 2022 presidential election, showed a mixed reaction to Hwang’s membership. Kim reaffirmed his position that he would not compete in the election for party leadership.